Ok, you’re ready to work with a financial planner and get a grip on your financial life. You’ve done some research, searched the web, talked to friends and family for referrals and that has landed you here. for your wants and needs is vital. at the top of your list. The criteria of what you are seeking with a Financial Planner may be detailed, but when you prioritize what's most important, you will find that AFP delivers a balance of head and heart with their thorough and experience-driven services. then AFP may be right for you. You are looking for an organization that puts you first and works with your total financial picture to support how you want to tell your life story. You would like to develop a relationship that is long-term and holistic for you and your family. You desire to work with an organization that is compensated solely by their clients, does not receive referral fees or commissions for services rendered. You are looking for more than the “Suitability Standard” which means the product you are sold is “suitable for your net worth and risk tolerance. You are looking for experienced advisors that put your interest first, above their own. You value transparency and objective advice. You are not looking for someone to sell you a product. You want to know that the fee you are paying is fair and in-line with the services you are receiving. You want to be heard. It is important to you that you can talk candidly and honestly, with someone on the other side of the table who is listening. You want to know that all questions are valid and that you will not be made to feel small or belittled by asking things you want to know. You would like to include your outside professional advisors into your financial conversation so there is a well-coordinated team approach. You are looking to organize and simplify your financial life by having all your financial assets under the watchful eye of one advisory group. You are looking for compassionate, knowledgeable advisors that can adjust with you... to be there when you need them. You want to delegate financial matters to give you the opportunity to focus your time and energy on the things that are most important to you. You would like the peace of mind and ease of going to one place, so you can see and store your financial information. Often times the terms financial planner and financial advisor are used interchangeably. Pretty much anyone can call themselves a financial advisor: commissioned stockbrokers, insurance agents, registered representatives, account executives, even the person selling annuities and mutual funds at your local bank. One minimum requirement to consider would be to select a Certified Financial Planner™ (CFP®) A CFP® is licensed and regulated. They are also required to maintain their CFP® mark through continuing education in all areas of financial planning. in determining a financial advisors' objectivity. are paid for their services. Commission advisors (i.e., stockbrokers) are paid only when they make a sale with financial advice they offer being incidental to the sale of the product. They are held to a “Standard of Care” requirement, which means the products they recommend must be generally reasonable for the client’s situation and risk tolerance. They are not required to disclose the amounts of their commissions to their clients or conflicts of interest that may influence a client’s ultimate decisions. This means commission advisors can sell products that may be best for them, not for you. Fee based advisors are also held to a “Standard of Care” requirement. They may receive fees directly from the client and commissions for products they are selling. Typically the client may pay a fee for financial planning advice and management of assets under the AUM model. However, the advisor may also receive commissions for product sales with life insurance or variable annuities. The advisor may also be compensated with commissions or 12B 1 fees for assets under management as well. They are not required to disclose the amounts of their commissions to their clients. 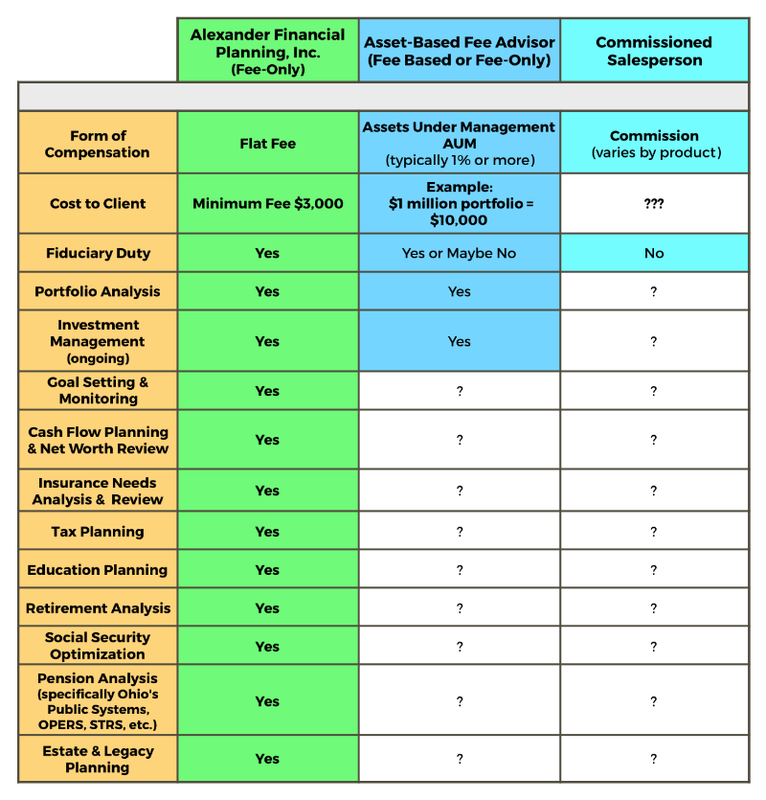 Fee-only advisors are held to a fiduciary standard, the highest standard of care. Their responsibility is to serve their clients to the best of their ability. This means they are required to put their clients’ interests ahead of their own and to openly disclose any conflicts of interests when making investment recommendations to their clients. Their compensation comes directly from the client, not from sales commissions, undisclosed fees, or third party agreements. Our "Service & Fee Comparison Chart"
offers more to our clients. Now that you have explored how a financial advisor is compensated, you've read their ADV, there may be a few more common questions to ask. Will they prepare a written plan? Does the financial advisor ask you good questions about your money history, expectations for the relationship, or what your primary purpose is to work with an advisor? How long have they been in business and has their business changed over the years? How many clients do they work with and what type of clients do they service? Do you feel comfortable talking to this person and do you feel you are being heard? Do they seem to care about you as a person? Some financial planners skim the surface of each area of financial life planning. Our team at Alexander Financial Planning provide a more holistic approach to financial life planning. Until you work with a financial planner, it is difficult to quantify the value you will receive in the advice you are given. we offer a no-obligation "Discovery Meeting"
to help you make this decision.